Reporters have paid close attention to Joel Chan’s (陳山聰) whereabouts since his break-up with Florinda Ho (何超雲) in April. While his ex-girlfriend was spotted numerous times enjoying life with friends, Joel was nowhere to be seen. Finally, he accepted an interview a few days ago and announced he is happy with his life and has found a new career outside the entertainment industry. Joel was spotted heading home from work in a suit and a pair of sunglasses. He carried seemingly heavy bags up to his apartment in Kowloon Bay. When he noticed reporters nearby, he waved at them in a friendly manner and announced he is going to Macau to visit his father. “I have a new career now, and I don’t need to depend on my elder brother! This has been my aim. I’ve always been apart from my brother in terms of careers, and I’ve never helped him. If I had meant to lend him a hand, then I wouldn’t have entered the entertainment industry a few years back! Family is family, and we don’t have any issues when it comes to dealing with money.” Joel revealed he also never helped write for his sister-in-law’s magazines in Macau. He has his own job and liked to keep things separate from family members. How is Joel’s life after his break-up? He stated firmly, “I don’t have to drive around a sports car or live in a huge house. I’m very happy right now.” Joel announced if he decides to return to the entertainment industry one day, he would be sure to inform everyone. However, he has no such plans at the moment. On another day at around 9 p.m., Joel was seen leaving his apartment wearing a V-neck shirt and suit. He met up with his brother and sister-in-law, and the trio headed towards a restaurant in Central. When Joel noticed reporters lurking nearby, he initially tried to cover his face with his hand to avoid the cameras. After composing himself, he greeted the reporters and left hurriedly with his brother. Well, that’s a shame. Despite what people say about his personality, I personal feel that he’s a good actor. Not really.. Look at Joey Wang, she left the circle over 10 years ago but when she came back to HK, everyone was following her every move. I think that once you are in the circle, you never truly get to leave. yup unless u move to a town where there is only foreigners and no t.v., electricity, newspaper. those are call…country side. that’s a shame he didn’t get anything from his relationship with a brat. I like him too, I do not believe he is as bad as the tabloids make him out to be. Like they said he ask Florence to give him break up fee, come on! How they know this? Both Joel and Florence denied anyways. After break up he did try to mend the relationship with Florence, it just didn’t work out. I do not feel that Joel is that bad of a person either. We all know how the tabloids are and how they like to exaggerate. It is a shame he left, he was a really good actor but wish him the best in his future endeavors he may may have been talented but probably wasn’t too passionate about it. He may or may not but honestly I don’t think he was ever really that passionate about acting, he’s obviously talented but you can kind of tell he doesn’t have that kind of passion for it like other artistes. I’m not basing this on his relationship either, even way in the past it’s kind of obvious how he felt about acting. It wouldn’t be a bad thing if he returned though. He has a great singing voice too! Same with me. Joel is a good actor, a lot better than any of the current top siu sangs in TVB. I hope he will act again in the near future. He is a talented actor. I hope he gets back to acting soon, too. Because TVB bloody needs a good actor. Especially for siu sung or supporting roles. A pity he does not have the passion or dedication of the less talented. Which is why the others are more deserving than he is of any opportunities. I don’t know what’s wrong with him. Is it his aim in life, if he is a woman, to be like a socialite? How is he a moron?? He made some poor choices and is now trying to get his life back on track. It’s not like he committed some big crimes or something. He made some VERY poor choices. He is a moron. Gosh Larry, I used to defend you but now I can see why some were saying how mean you can be with your choice of words. Thats fine, because no one is perfect when Joel is a moron. Well, you can’t judge a person based on what you’ve read from the tabloid unless you truly know him. No really? He dump his career to go after that fashion mess wealthy queen. It wasn’t last longer then hitting rock bottom. He did make poor choices and has suffered the consequences of his decisions already, so now he is trying to move on with his life. It’s not that like he did really really bad things that are unforgivable. Others have done worse and were all forgiven and have live a happy life, so why can’t he??? Didnt he stop talking to his TVB buddies and focusing on Florinda Ho 100% before breaking up? I doubt some of his TVB friends would forgive him. We all are, honestly as we grow older each year we realize what kind of dumb decisions we made the year before and this goes on and on. So he may or may not have made bad decisions, all of us wish we didn’t do the things we did the year before. I don’t see how he is any different than any of us, he’s human and how do you suppose a human being should reflect and recognizes his mistakes without going through it? Sure you may not have given up your career over a woman and that may be a dumb decision in your opinion but for Joel, I don’t think he feels that way and he shouldn’t either. Agreed with Larrys choice of word. How old is he? He was probably old enough to be a father doing the right thing instead he screws around. Only time will prove if he stay as a moron or not…but for now he is entitled to that name. Completely agree. We’ve all made bad choices; we just don’t have to share them in the media with everyone else. Thank you people, until he really turns around then the moron name will be drop. i don’t disagree he made some poor choices and definitely was a moron then but he sure doesn’t seem like a moron now and that’s what matters. I’m sorta glad that he’s out of the entertainment industry. He was never my favourite and probably himself in reality (magazines’ news) leads me to think that he isn’t so likeable either. However, he does have good looks so I guess if I watch back, “Glittering Days,” I might start to miss him..
Joel Chan did really well in “The Curse of the Royal Harem”, much better than he did in “Glittering Days”. Personally I think he was the BEST artiste in “The Curse of the Royal Harem”. Everyone make a wrong path once or twice in a lifetime. But the most important part is the knowledge that you know what you did wrong? Look like he is happy to live a normal life now. Please enjoy and hope to see you in the movie in some future day. He is a great actor, I like to watch his movies, hope he is happy with his new venture. Wish him all the best. Too bad. He’s actually a good actor. I will miss seeing him onscreen. I think we would never ever know an actors true character. Even the super nice ones such as Linda or picky ones like Francis can just be some kind of facade for us to label them. Actually Linda isnt the best example of super nice. She is nice but not that super nice. Kate gives more frindly vibe than Linda. Good actor… really liked watching him. Hope he returns to acting at some point. I think he is a good actor too… Really liked him in “The Last Steep Ascent.” The chemistry between him and his 4th wife… (forgot her name) was indeed entertaining. Yes, I most looked forward to scenes between him and Samantha, also his bromance with Moses! yeah it is a shame. i do so enjoy his acting. hope tvb gives him a chance. From the picture he looks like a bellhop in a hotel…maybe that’s his mysterious new career. I like Joel. Think he’s definitely one of the better actors in TVB. Especially enjoyed his performance in E.U. and LSA where he was a real scream. His scenes in LSA were what I looked forward to in the series. He has a versatility that not many actors can boast of. 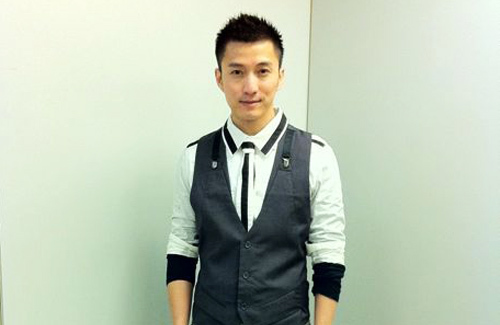 Hope he returns to TVB some day. He has huge potential.